Before the summer and outdoor season even began, 2018 found us standing up for parks and beaches in the South Bronx and the Rockaways, two areas facing very different but very serious issues. Parks in the Hunts Point neighborhood are facing threats from proposed off-ramps from the Bruckner Expressway, as part of the New York State Department of Transportation's “Hunts Point Interstate Access Improvement Project.” In our recently-released Southern Boulevard Open Space Index, a study centered on an area adjacent to Hunts Point, we found that access to open space is a widespread challenge but is particularly acute for people seeking to access the waterfront parks, Concrete Plant Park and Starlight Park, that now line stretches of the Bronx River coastline. The ramp proposal put forth in the Project would create physical and psychological barriers to accessing these open spaces, all of which were the result of decades of hard-fought advocacy by community members. The ramp would also bring increased air pollution to the neighborhood, which already has some of the worst asthma rates in the city. 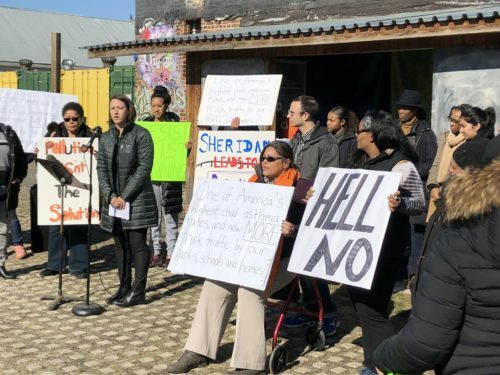 NY4P is particularly troubled because the New York State Department of Transportation (NYSDOT) hasn’t even considered the preferred plan of the South Bronx Watershed Alliance, the coalition of community partners representing residents, advocates, and local businesses. Their plan is based on a 2013 study conducted by the City of New York, developed after extensive public process. The community feels that this plan would protect their neighborhood while also meeting the need of Hunts Point terminal. In our testimony to NYSDOT we urged them to respect over a decade of community planning, protection and care for Hunts Point parks. Meanwhile, in the Rockaways, community members and business owners are dealing with a temporary beach closure that could have significant impacts on businesses that depend on seasonal customers. While much of the beach remains open – and we encourage everyone to visit – the closed portion is at one of the most popular sections of the beach, where many small businesses are located. NYC Parks is taking commendable steps to address the issue as much as they can. The closed portion of the beach is being reopened – on a trial basis – when tide conditions allow, and have invested in improved wayfinding and programming to increase foot traffic along the boardwalk. They’ve also offered to temporarily defer a portion of rents. But while NYC Parks had to make the decision to close the beach due to safety concerns, which are paramount, we felt that it could have been done better. And we said as much to the New York City Council. At the City Council oversight hearing on beach erosion, we stood up for local residents and said that New Yorkers need better communication and coordination from the City. With extreme weather events happening more and more frequently due to climate change, our city needs to be prepared to deal with these issues again in the future. As days get hotter and hotter, we need our beaches and waterfront parks more than ever.